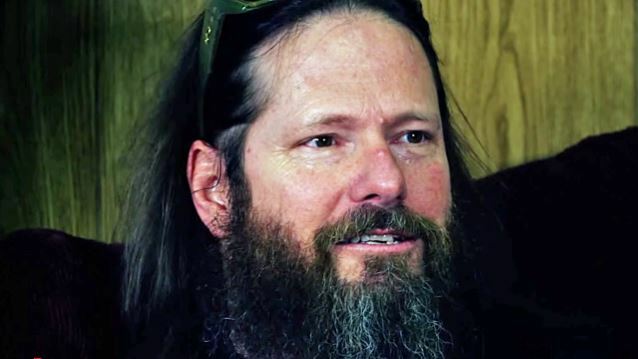 In a brand new interview with SF Weekly, SLAYER guitarist Gary Holt was asked about the band's motive for covering a lot of violent, dark topics in its lyrics, like murder, necrophilia, Satanism, Nazism, and terrorism. He said: "People in bands such as SLAYER and my other band EXODUS get asked that all the time. But it's like no one really questions when you see these same topics in movies and are bombarded by them on a day to day basis on the news. Maybe it's because they feel music glorifies and everyone else reports. But I think in our own musical way that's all any of us are doing as well: just reporting. And obviously there's flights of fantasy mixed in with all the stuff. But it's music. If you took the SLAYER classic 'Angel Of Death' and removed the lyrics and changed it to 'angel of life,' it just wouldn't work. It wouldn't have quite the same impact. Like our songs about Josef Mengele. If you made it about Mother Teresa, it wouldn't quite work." Holt also talked the accusations of white supremacy and Nazism that have been leveled against SLAYER. He said: "I think that's one of the most ridiculous things when people say that. [Late SLAYER guitarist] Jeff [Hanneman] was a big World War II historian and Jeff wrote all those songs. I'm old enough to remember when the History channel showed nothing but shows on history and then it was basically Adolf Hitler all day long. But if someone writes a song about it, it's like all of a sudden, whoever wrote it is obviously a Nazi sympathizer, which is so untrue. It's a history lesson. You're covering dark subject matter and you're looking for something that you find twisted enough to go with the riffs you're writing for the song. You know, you can make a movie about it and it'll win an Oscar, but a band writes it and all the sudden they're Nazi sympathizers. I always found that to be completely ridiculous." Holt, who is still a member of San Francisco Bay Area thrash icons EXODUS, has been the touring guitarist for SLAYER since January 2011 when Jeff Hanneman contracted necrotizing fasciitis, also known as flesh-eating disease, from a spider bite in his backyard. The infection ravaged the flesh and tissues of Hanneman's arm, leading to numerous surgeries, skin grafts and intense periods of rehab that forced him into semi-retirement and left him near death at several points. Holt did not contribute to the songwriting process on SLAYER's latest album, "Repentless", although he did lay down guitar solos on most of the album's twelve tracks.